You thought I forgot about Flip 6 didn’t you? It’s been a minute since I’ve done a Flip 6 post, but don’t let that fool you. A lot was transformed at this courthouse auction house. Since I had no idea what I was getting into before I bought the house, everything was a surprise once I started the flip- which is both equally terrifying & exciting. And one might get excited to learn that the main bathroom had been “updated” at some point, until you realize it was updated with a hodgepodge of clearance mismatched tile. The original tub/shower combo had been gutted at some point to create a spacious walk-in shower. A few problems with this design choice was that was the only tub in the house– an asset to families with small children. Another issue is that they used a variety of tiles in the shower, and it was an odd sized shower. Ideally, I would’ve gutted the “updated” shower, and put in a tub with a beautiful tile surround. 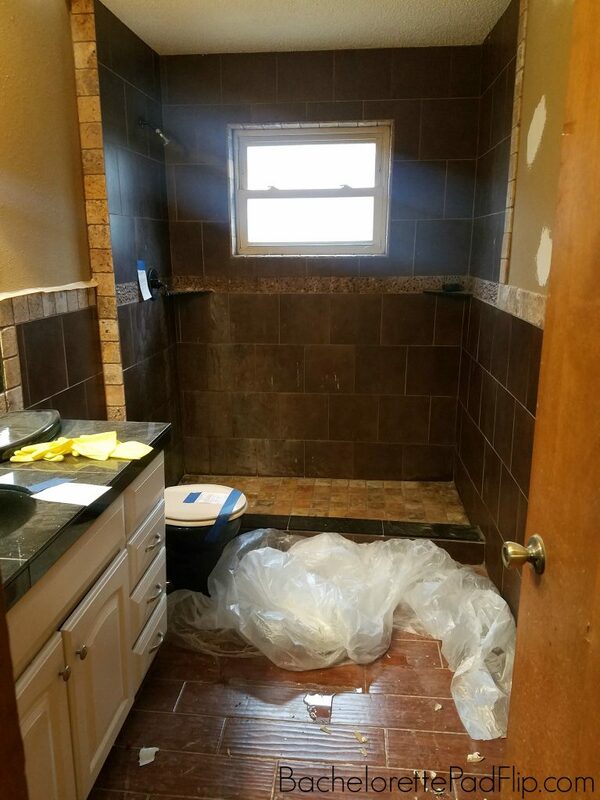 But this is the real life of house flipping: you don’t always get to do what you want. The budget was T.I.G.H.T. on this one since I paid the max I was willing to pay for this house. So the reality as opposed to the ideal: everything (ugly tile and all) had to stay. Since I was forced to work with what I had, I had to get really creative. The first order of business was to remove the black busted toilet and replace with a white one. There were so many dark (mismatched) finishes in this room, that I wanted to bring in anything that was lighter. Even if that meant a white toilet as opposed to a black one. The next hurdle I had to cross was the shower. It was all staying, but I wanted it to feel like a nice, spa-like shower. 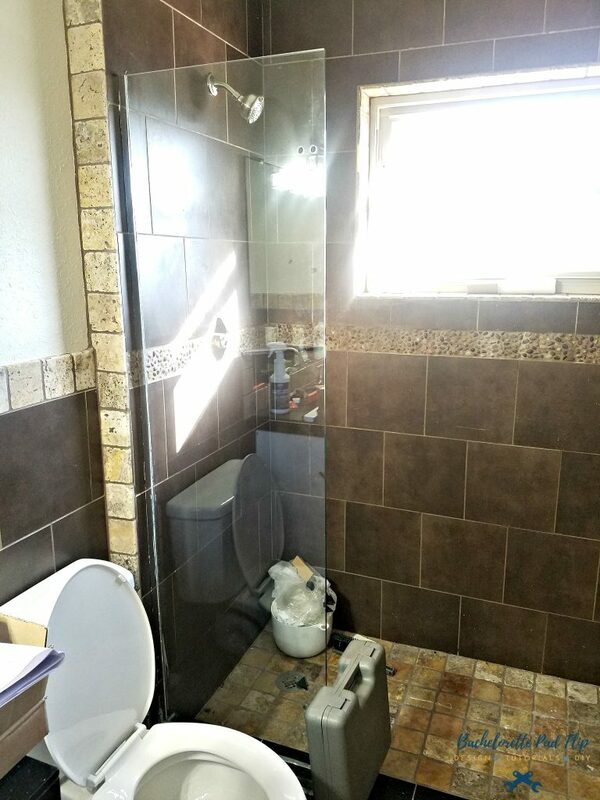 Since it was odd-size, the previous owners were using a shower rod and curtain setup. I just thought if I kept it that way, it would feel unfinished and cheap. But there was one little problem with that– it was odd size which meant, to get a standard shower door, I was looking at well over $1,000. And if you’ve been around The Bachelorette Pad Flip for any length of time, you can probably accurately guess if I’d spend $1,000 on a shower door. Instead I opted for a new design in shower doors- crescent frameless swinging doors. They are not designed to cover the entire space. Instead, their entire design is made to create an “open” look. And since I had an odd size shower, this was literally my only affordable choice in shower doors. Unlike most shower doors, this one swings rather than slides. 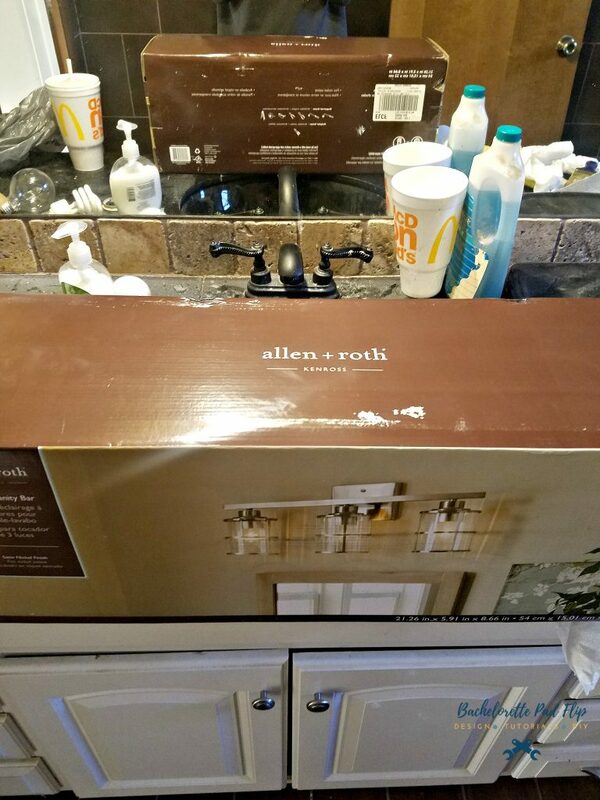 I purchased it via Lowe’s online and after a shipping snafu and delay, I eventually got the door and my brother in law installed it. The downside to these shower doors– besides that they are ENORMOUSLY heavy, is that they are a unique design, and for some, that might be a problem. For a house flipper, if it’s the best you can do, then you take it. The existing finishes were in oil-rubbed bronze…another dark finish. I removed the oil rubbed bronze faucet, shower head, and light fixture and replaced with brush nickel. Did this make a huge impact? Probably not, but I was as much dark GONE as I could do. I purposely chose a light fixture that did not have a frosted globe– I wanted one with a clear globe to really illuminate the room. I also chose LED white light bulbs so the room would feel incredibly bright. There are yellow light & white light bulbs, and if you’ve never paid any attention to the difference, they are substantially different. I always choose white light to make a room feel bright and light…and this room definitely needed that! My final step was to give the walls a coat of Edgecomb Gray to lighten it up and add a new white door, and then it was time for staging. I chose lighter color linens and brought in apothecary jars full of white (cotton balls, q-tips, soaps, etc). Is this room a dramatic transformation? No, the budget didn’t allow for that. Is it better than when I bought it? Definitely. One of the hard lessons some wanna-be house flippers learn the hard way is there is a line between what you want and what you can do. 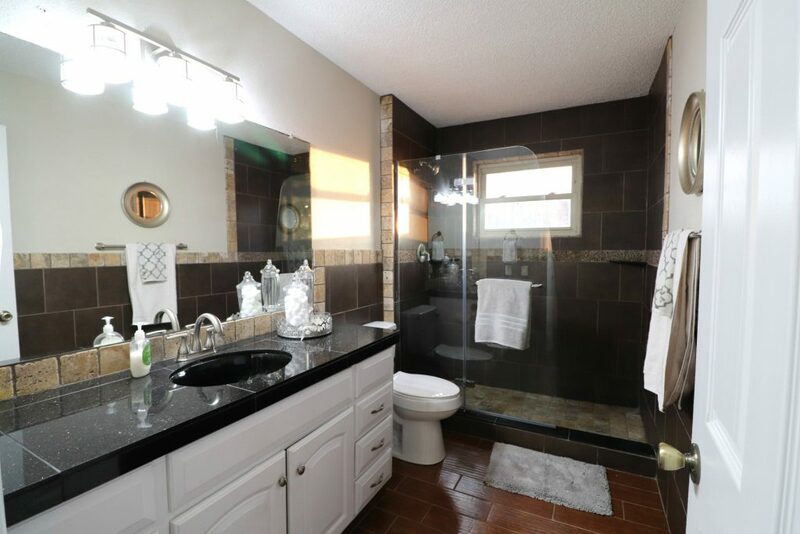 None of this bathroom is my personal style, but that’s not the requirement in house flipping. Working with what you have, staying aligned with a budget, and leaving it better than you found it is a success in my book. Very nice outcome, especially looking at the before pictures. And, honestly, there are plenty of people who like the dark colors in the tiles. We may not like them, but the market is there. The retail home decor store where I work still has some remaining dark brown lamps and accessories and they sell!! Everything helped bring this dark eyesore into a more pleasing look. The lighter finishes, the shower glass and the paint have transformed the space into a very pretty one.